FREE Event • All Ages Welcome! Join YOUR local park in celebration of our green spaces and the communities who love them! 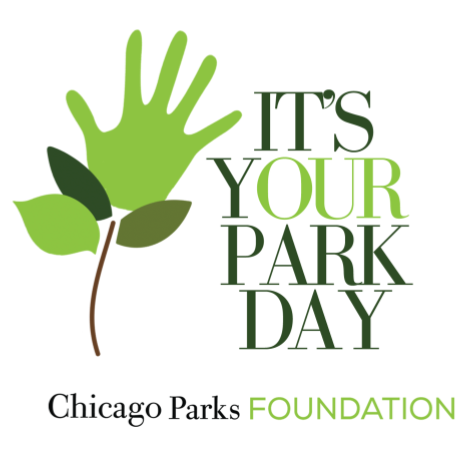 The Chicago Parks Foundation’s annual volunteer event is a day of park clean-ups, tree mulching, enhancement projects, and community fun across 50+ Chicago parks. Registered volunteers receive a t-shirt and refreshments. Activities & hours vary by park - see list of participating locations below. Thank you to our Park Advisory Councils for their support! PARK REGISTRATION IS NOW OPEN! Park Advisory Councils serve as the main IYPD event contacts. Start by registering as a participating park location by clicking below to complete the online registration form. VOLUNTEER REGISTRATION IS OPEN, TOO! Don’t see your park yet? Stay tuned as more participating park locations are listed here as they become available. *If you register after May 20th or do not pre-register online, we can not guarantee you an event t-shirt. Interested in sponsoring It’s Your Park Day? Contact events@chicagoparksfoundation.org. Why do I have to register on Eventbrite to participate? Registering in advance on Eventbrite gives us an idea of how many people will be participating at each location so that we can adequately equip the parks with enough supplies. We also ask that you review and accept our event waiver for your safety. Plus, only those who register in advance are guaranteed an event t-shirt! Links to registration for each park will be listed above as they become available. What should I wear to IYPD? Dress comfortably! We recommend closed-toe shoes and outdoor work clothes that you wouldn’t mind getting dirty. Please also protect yourself from the sun with sunblock, hats, sunglasses, etc. What should I expect my tasks to be for the day? Tasks vary by park and may include trash pick-up, tree mulching, gardening, planting, hedging, and weeding. Cleaning and organizing may also be needed inside your field house. Some parks also include family fun days, live musical performances, and other additional activities. Unless otherwise noted, you will check in at your park’s field house or main building. An email will be sent to all registered volunteers during the week of It’s Your Park Day with event day reminders. Can I bring my family or friends if they haven’t registered on Eventbrite? Absolutely! We will have day-of participants complete a waiver on-site. However, please be aware that you are not guaranteed a volunteer t-shirt if you do not register in advance. Yes, the more the merrier! We do ask that each individual registers so that we receive a completed waiver from all participants. Contact us at events@chicagoparksfoundation.org if you would like assistance coordinating a group of volunteers. The Chicago Parks Foundation will provide light snacks and water to all participating park locations. Some parks may provide additional refreshments. We encourage everyone to bring a reusable water bottle as well. All of the supplies needed for your park tasks (gloves, trash bags, tools, etc.) will be provided. If you or your company are interested in donating additional supplies, please contact us at events@chicagoparksfoundation.org. Yes! Only in the case of extreme weather may the event be affected. Registered participants will be contacted prior to the start of the event in such a case.